We are excited to connect with participants at the Open Education Conference 2017 in Anaheim, California! We are facilitating conversations between people onsite and offsite who would like to connect at this annual conference that focuses on multiple aspects of open education. If you’re new to Virtually Connecting read more about us. If you would like to join in one or more of the conversations listed below, please sign up on this form or jump to the bottom of this page. We’ll send you an email to confirm, as well as send you the information needed to participate. The times are local to the conference, which is Pacific Daylight Time, UTC -7. Scroll below to find the times adjusted to your timezone. The links to watch the sessions below become live during the session times so you can also watch here if you don’t want to join as a participant, and the sessions are also recorded so you can come back to this post later to watch them if you wish. You can also watch more on the #OpenEd17 Playlist or other recorded Virtually Connecting sessions on our YouTube Channel. Jim Luke, Robin Derosa ~ A Special Live Roundtable Event assisted by Ken Bauer onsite and virtual buddy Alan Levine. Virtual Speed Dating ~ Now that might be a first! Meet and chat with conference participants and virtual participants led by Rolin Moe and onsite buddies Ken Bauer, Terry Greene and Tom Evans. The virtual participants will be led by virtual buddy Mandy Honeyman. This is a a unique and experimental session that was proposed by Rolin and Ken agreed to help make it happen. We will keep the number of virtual participants down to a smaller number (say 3 or 4) but with multiple simultaneous sessions to connect more virtual participants to the onsite “speed dating”. The goal of this session is to help people meet and interact with those they might not ordinarily connect with. The set-up includes multiple round tables. The session is divided into multiple rounds. During each round people interact with others at their table. At the end of the round they get up and move to a new table. These short meetings will create connections that people can then follow up on at other points during the conference. When the session begins, each person will have 1 minute to introduce themselves, where they work, and why they came to OpenEd. Each table will also have a person who is the timer (everyone in the past has used their phones). After about 10 minutes a bell rings, signaling the end of the round. Everyone seated at a table will then get up and go to a different table. The purpose of having multiple rounds is to allow people to move around and meet different people during every round. The plan is to have one of the virtual buddies (Terry,Ken,Tom) setup a session with 3-4 virtual participants and then they sit at one of these tables to allow those virtual participants access to the session to be part of getting to know others in the Open Education community. This will be a blast, sign up using the form here or jump to the bottom of this page for the embedded version. Cable Green and Ryan Merkley joined by Ken Bauer and Terry Greene onsite with virtual buddy Christina Hendricks. Chatting with Sukaina Walji and Henry Trotter onsite with Terry Greene and Tom Evans, and virtual buddy Christian Friedrich. Chatting with Kin Lane, Mike Caulfield, and Bonni Stachowiak, with Ken Bauer onsite and virtual buddy Joe Murphy. Chatting with a great crew of Jim Luke, Amy Collier and Adam Croom onsite with Ken Bauer and remotely with virtual buddy Kristen Eshleman. Chatting with Regina Gong and Vedham Karpaka with Samantha Veneruso onsite and virtual buddy Helen DeWaard. Chatting with Robin DeRosa, Gill Green, Rajiv Jhangiani, Jamison Miller, Rosario Passos, and Tara Robertson, with Karen Cangialosi and Scott Robison onsite and virtual buddies Helen de Waard and Christina Hendricks. During #OpenEd16 there were no livestream sessions officially but some attendees created some. You may want to watch the #OpenEd17 hashtag on Twitter to see when impromptu feeds show up. Active video/audio session participation: be a participant in the session and talk to the guests and other participants. You can talk to those in the session either through your computer or mobile Google Hangouts connection (be sure to update your Hangouts apps or plugins as needed), or you can do so via text chat (this will be seen by people inside the session but not those outside the session; but the virtual buddy will occasionally read out what you wrote or invite you to say it out loud). To participate in the session, you need to register by filling out this form (also embedded below). One of us will contact you to get your email address, and then you will get a confirmation email a day or so before the event, and a link to participate in the Google hangout around half an hour before the event. Watch and tweet: watch the session live (see the embedded videos above or go to the #OpenEd17 Playlist on our YouTube channel). 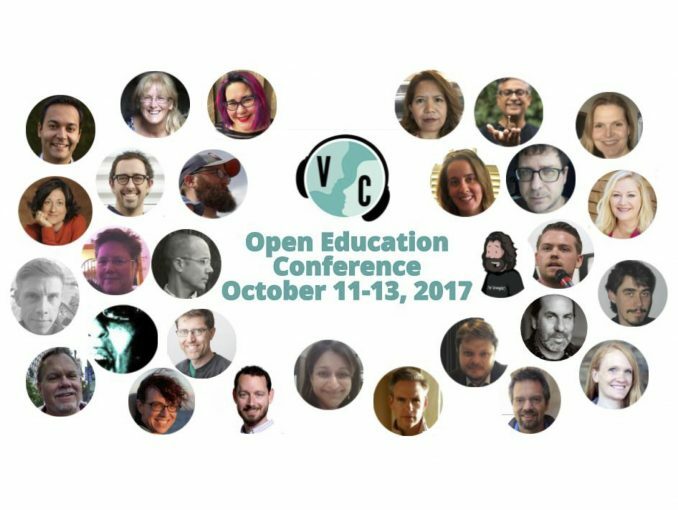 If you choose to Tweet along, please tag @VConnecting and add the conference hashtag: #OpenEd17. One of our buddies is likely to pick up on your questions on Twitter and relay them to the participants in the live session. If you are attending the conference and wondering what’s for me, stop by–we would love to see you!! You don’t have to appear on camera. We would love for you to come by, listen to the conversation, take pictures, and tweet about the experience (don’t forget to tag us @VConnecting and use the conference hashtag #OpenEd17. Sometimes those watching and listening onsite want to jump into the conversation and appear on camera. Depending on the session, how many people are there, and other logistical factors specific to that onsite moment we may or may not be able to accommodate this. So, how do you find us? The key to joining up with us onsite is connecting with the onsite buddies @ken_bauer @professorsv @karencang @OtterScotter @greeneterry @taevans Connecting with us onsite can be tricky because each conference treats our sessions differently, our first activity is in a live session at “Table 16”, the activity with Rolin Moe is still pending on location and the other activities will be in one of the foyers. But please connect and come by, it would be great to meet you and you might be our next onsite or virtual buddy.